The axons of normal nerve cells are surrounded by a myelin sheath, a protective layer that enables electrical impulses to be conducted along the axon. MS and SCI are characterised by the loss of myelin (demyelination). Demyelinated axons lose the ability to transmit nerve impulses. 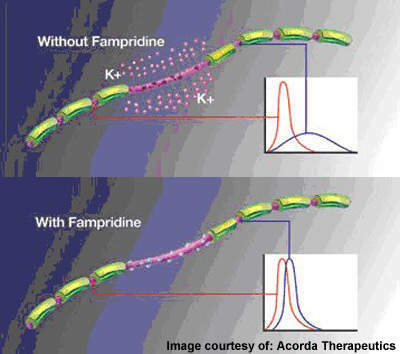 Famipridine-SR is designed to block specialised potassium channels on axons and restore nerve impulses even in a demyelinated state. Famipridine-SR is the most advanced product in Acorda Therapeutics' R&D pipeline that also includes remyelinating monoclonal antibodies and neuregulins. Developed by Acorda Therapeutics and manufactured by Elan Corporation, fampridine-SR (now referred to as AMPYRA) is a selective neuronal potassium channel blocker under investigation for the treatment of multiple sclerosis (MS) and spinal cord injury (SCI). Fampridine-SR is a slow-release formulation of 4-aminopyridine. It has a longer half-life and lower peak serum levels than immediate release formulations. It has been developed to increase duration of therapeutic effect and reduce dosing burden, as well as to reduce the incidence and severity of drug-related adverse events. Phase III clinical trials have been conducted in MS patients, and are ongoing in SCI patients. Positive results were announced from the second Phase III trials of the drug involving MS patients, on walking ability, in June 2008. Acorda’s new drug application (NDA) to the US Food and Drug Administration requesting priority review and a prescription drug user fee act (PDUFA) dated 22 October 2009 was accepted on 6 May 2009. The NDA was submitted on 30 January 2009. The company obtained a new active substance status grant for the drug from the European Medicines Agency in June 2009. The agency also granted the company’s eligibility to submit a marketing authorisation application for fampridine-SR. 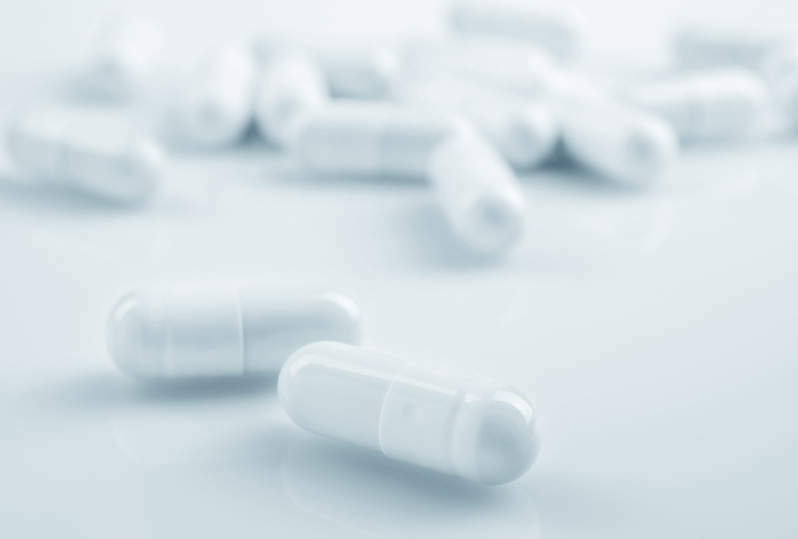 In June 2009, Acorda collaborated with Biogen Idec, a developer and manufacturer of therapies, to develop and commercialise fampridine-SR outside the US. Fampridine-SR and other aminopyridine products developed under the agreement will be commercialised by Biogen Idec. The company is also responsible for future clinical developments of fampridine-SR in markets outside the US. 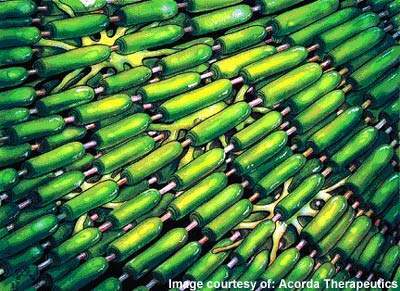 Acorda has received milestone payment of $110m from Biogen and is eligible to receive another $400m. Acorda and Elan’s subsidiary Elan Pharma International entered into a supply agreement through which Elan continues to commercially manufacture fampridine-SR. Acorda will pay Elan 7% of the royalty received from Biogen Idec. 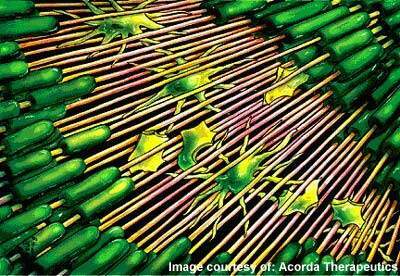 In the same month, the new sclerosis drug from Acorda was qualified for a centralised regulatory review in Europe. In January 2010, fampridine-SR was approved by the FDA for treatment of MS. The drug has seven years of exclusivity for this indication due to its orphan drug status. In the same month, the company also submitted a marketing authorisation application to the European Medicines Agency and a new drug submission to Health Canada. In March 2010, fampridine-SR was launched in the US and Puerto Rican markets. Acorda also filed for extension of two patents of fampridine-SR in March 2010, which will provide another five years of patent protection for the drug. These patents are set to expire in December 2011 and July 2013. MS is an inflammatory autoimmune-mediated disease of the nervous system that is characterised by recurrent relapses followed by periods of remission. After trauma, it is the second most common neurological disability to affect young and middle-aged adults. It affects twice as many women as men, with the relapsing forms of MS the most common. Patients with MS display a range of symptoms that arise from demyelination (loss of myelin sheath) in the central nervous system, which includes the brain, spinal cord and optic nerves. Although symptoms vary between patients, they commonly include blurred vision, numbness or tingling in the limbs, slurred speech and problems with balance and coordination. Prominent inflammatory and autoimmune responses are also evident in patients with traumatic and compressive SCI, in whom there may also be demyelination. Demyelination alters the structural and functional relationships of voltage-gated ion channels along the axonal membrane of the nerve cell. Exposed channels cause potassium ions to leak, so causing the axon to “short circuit”. By closing exposed potassium channels in these damaged nerve fibres, fampridine-SR enables the axon to transmit nerve impulses again. Fampridine-SR advancement to Phase III development in MS was completed in 2009, following encouraging results from earlier Phase II trials. Data from these trials showed that in comparison with placebo, treatment with fampridine-SR led to an improvement in walking speed and a significant improvement in leg muscle strength. Impaired walking and muscle weakness are two of the most common and devastating aspects of MS. The Phase III programme included the MS-F204 trial, in which fampridine-SR was administered to 240 MS patients. In this trial the safety of fampridine-SR was evaluated together with its effectiveness in improving walking ability. A consistent improvement in walking speed as measured by a timed 25ft walk was the primary outcome measure, with the lower extremity manual muscle test a secondary endpoint. Improvements over placebo were also observed in the two trials in which fampridine-SR was administered to SCI patients, although the results failed to reach statistical significance for the two primary endpoints: reduction of spasticity as measured by the Ashworth score and improvement of patients’ subject global impression rating. Despite these results, Acorda Therapeutics remains committed to the continued development of fampridine-SR for SCI. The advent of the first generation of disease-modifying drugs, which include interferon beta-1a and 1b as well as glatiramer acetate, represented an important advance in the treatment of MS when introduced into clinical practice. Approved for the treatment of relapsing forms of MS, they reduce the frequency and severity of exacerbations as well as the number of lesions seen on MRI scans. prevent disability arising from disease progression. Trial results suggest that fampridine-SR may have a beneficial effect on walking and muscle weakness, symptoms of MS that are not well met by available therapies. MS is a chronic and disabling disease, with healthcare costs disproportionate to the numbers affected. In the US alone, costs are estimated to exceed $10bn a year. Walking impairment is a pervasive and seriously debilitating effect of MS. Treatments that have potential to address muscle weakness and improve walking ability could make a significant contribution to improved quality of life in MS and other demyelinating diseases.